A recent article about detecting offline social networks from information about preferred WIFI networks leaked by mobile devices led me to have another look at the work I’d done looking at WIFI location detection to see what other information I could derive. I had been having problems with finding WIFI adapters with the right chipsets to allow me to use them in monitor mode in order to capture all the available packets from different networks, but recent updates to some of the WIFI drivers in the Linux kernel have enabled some more of the devices I have access to. Previously I build a small application which works with the Kismet wireless scanner application to publish details of each device spotted to a MQTT topic tree. With a small modification it now also published the data about the WIFI networks that are being searched for. You can have a look at the flow here. 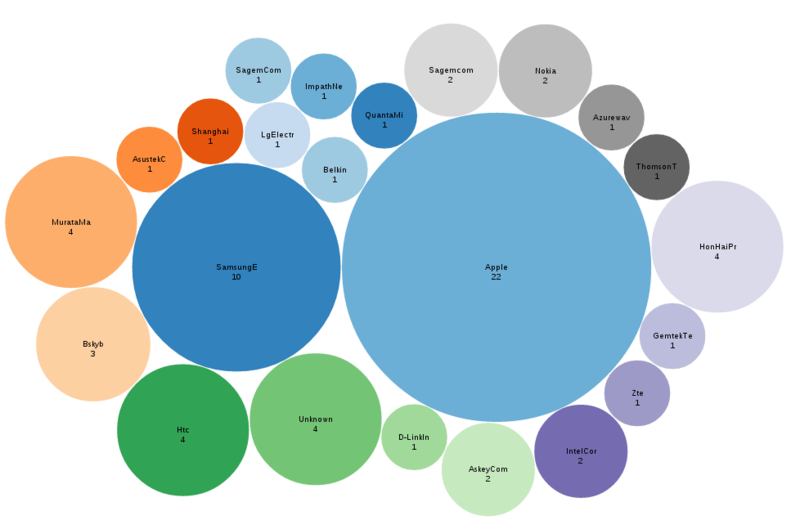 From the device’s MAC address it is possible to determine the manufacture, so with another little node application to query the MongoDB store I can generate this d3js view of what type of devices are in use in the area round my flat. The view dynamically updates every 5 seconds to pick up the latest information. Now I know who owns what type of device, time to see who might know who. 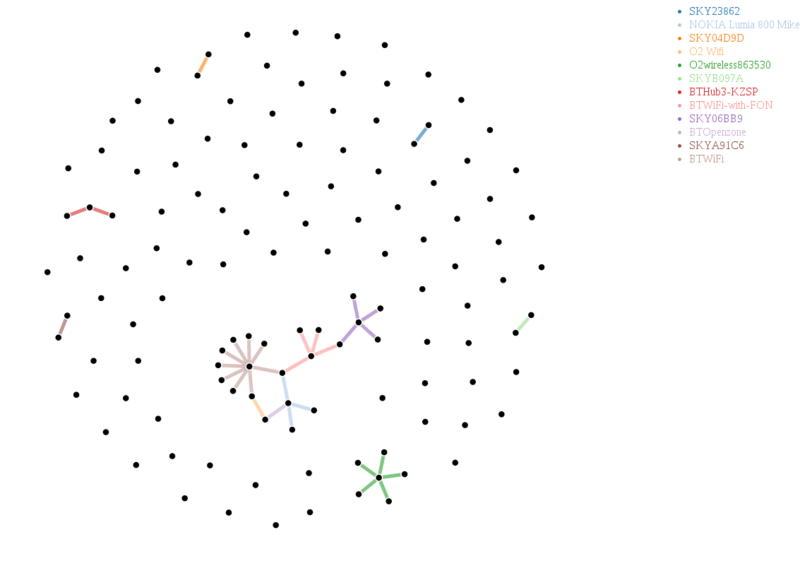 By plotting a force directed graph of all the clients detected and linking them based on the networks they have been searching for I can build up a view of which devices may belong to people who know each other. There are a couple of clusters in the data so far, but most of them are from public WIFI networks like BTOpenzone and O2 Wifi. After filtering these services out there was still the 3 devices that look to be using Mike’s Lumina 800 for internet access and 4 devices connected to the same Sky Broadband router. I expect the data to be a lot more interesting when I get to run it somewhere with a few more people. At the moment this is all running on my laptop, but it should run fine on my raspberry pi or my home server, as soon as I’ve transferred it over I’ll put a link up to live version of the charts.